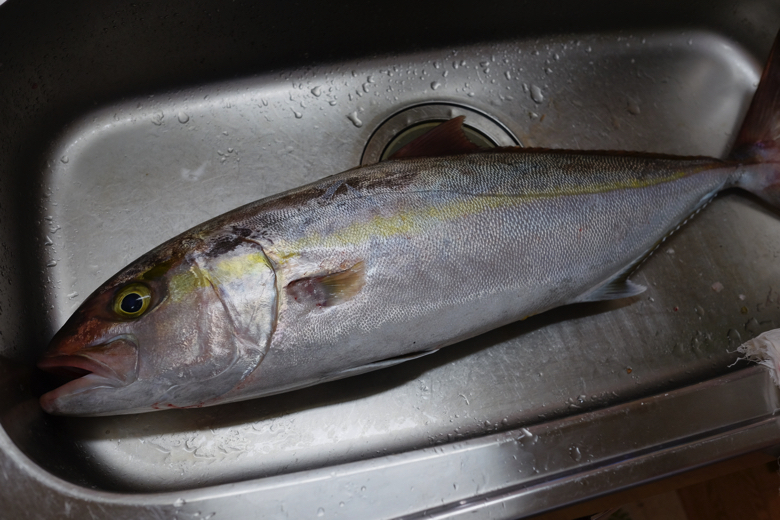 Now the Kanpachi (amberjack) fishing season is in its mid-season here in Okinawa. Time to fish and party! 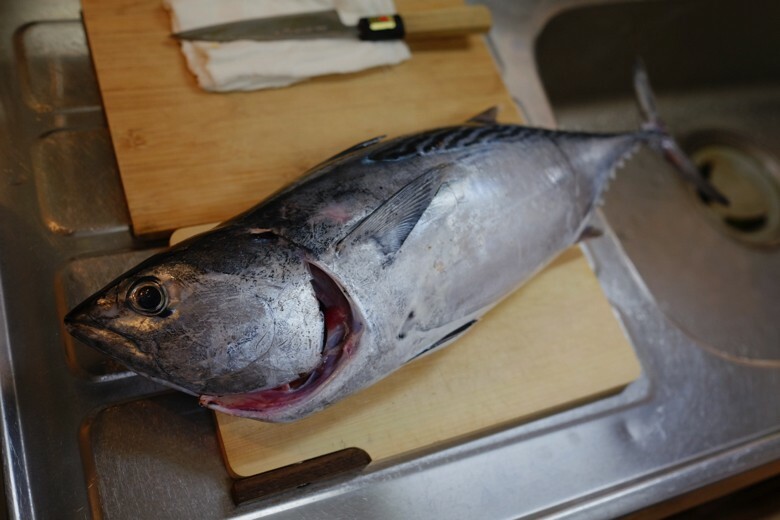 This is a mackerel tuna. 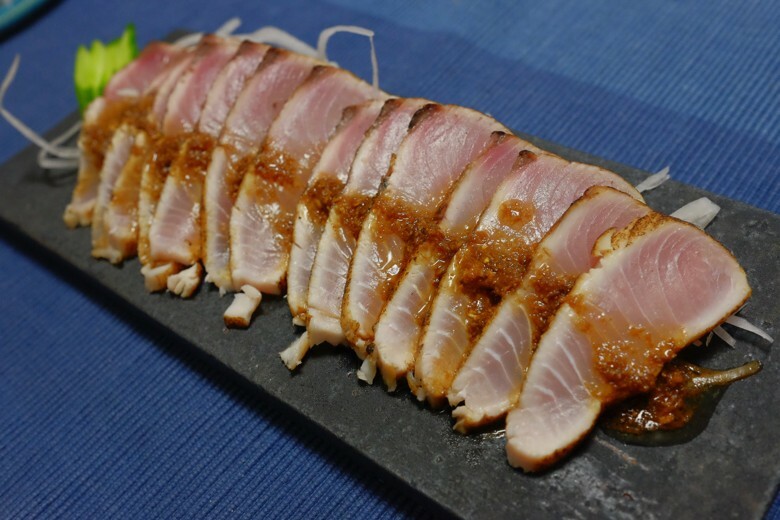 The best tasty one in Katsuo family. “Suma” we call it. It’s got the signature black dots under pectoral fins. You hardly find this fish in the market. They move in very small groups and they are scattered in the open waters. They are so good to eat, and fast to go bad. 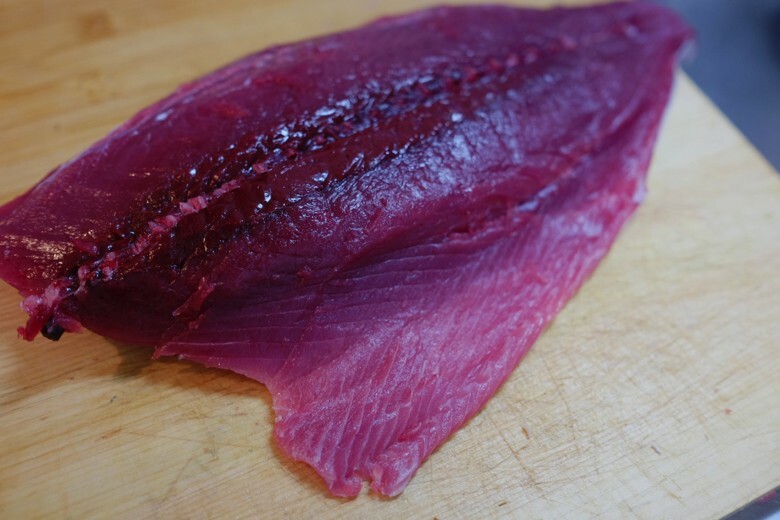 So fishermen usually keep and eat them, and don’t sell to the market. It’s an angler’s privilege to enjoy this fish. Look at the marble in the belly. 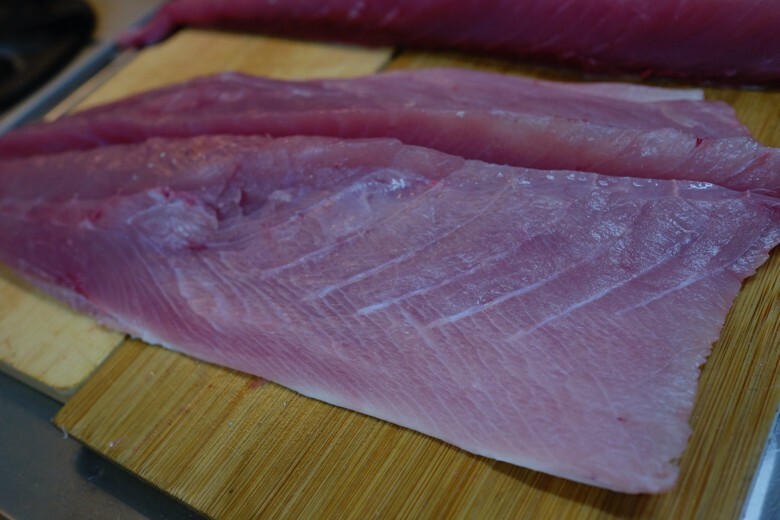 This fish is fast to go bad, because it’s packed with unsaturated fats. These fats are ready to react. So good for your body, but it also means that it’s so easy to get oxidized. It’s very quick to lose taste. Better have it within 2 days after the catch. Needs to be properly cleaned and stored of course. Deep reddish color. It’s packed with essential amino acids too. 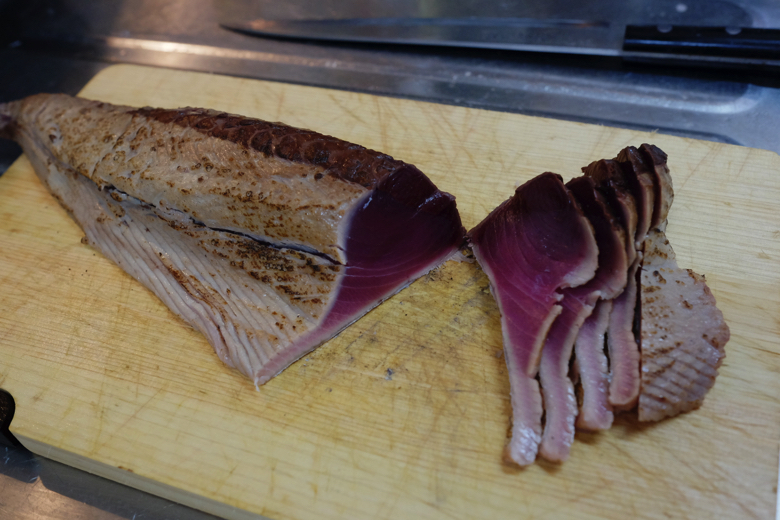 I’m making Tataki. 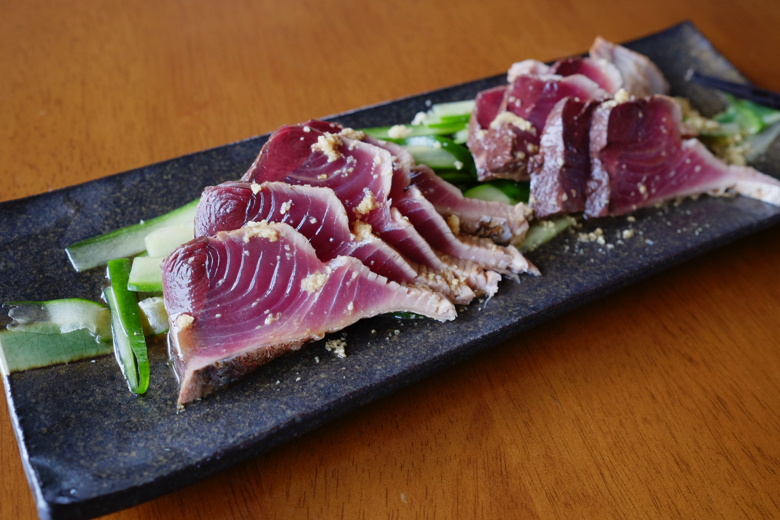 Tataki is still a form of sashimi. Lightly grill the surface, just to get that caramelization, but it’s still raw inside. Tataki is originated in Kochi region of Shikoku Japan, which is famous for Katsuo (this kind of small tuna family) fishing. It was in Edo era, the samurai government, way before the refrigerator. 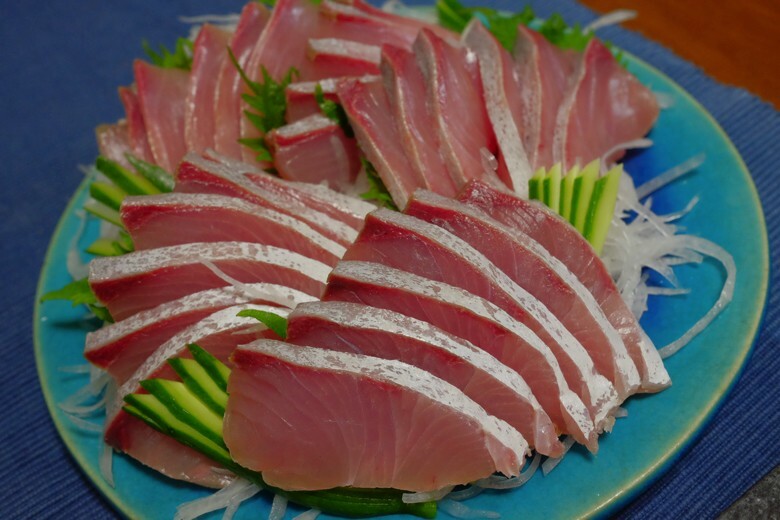 Kochi governor banned sashimi eating of Katsuo. 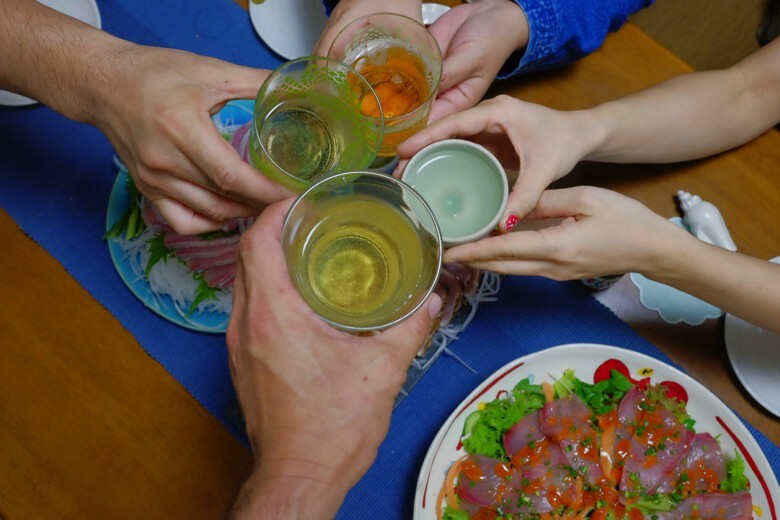 People loved Katsuo sashimi. It was too good to resist, but a lot of people got poisoned over this fish. But people were hard to give in. That’s how Tataki was invented. 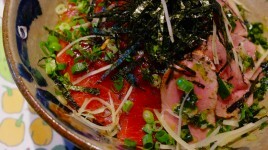 It was cooked, not sashimi! 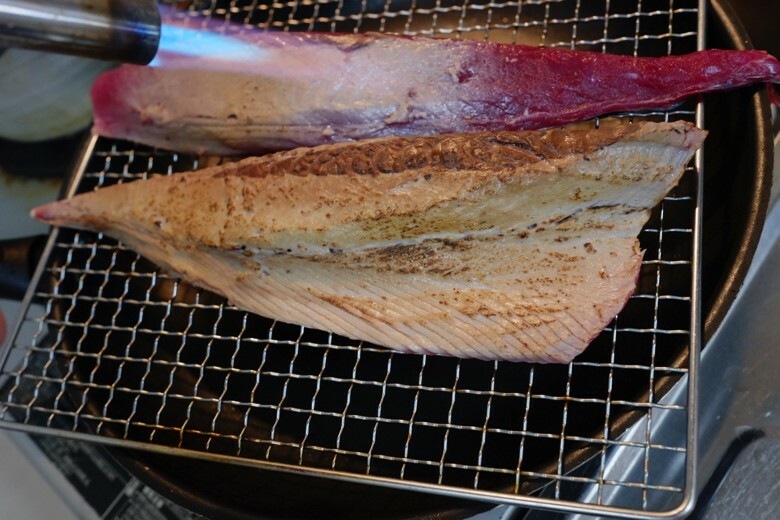 And it actually burns the germs and parasites this fish is likely to have on the surface and the Maillard reaction works as a shield to protect inside. 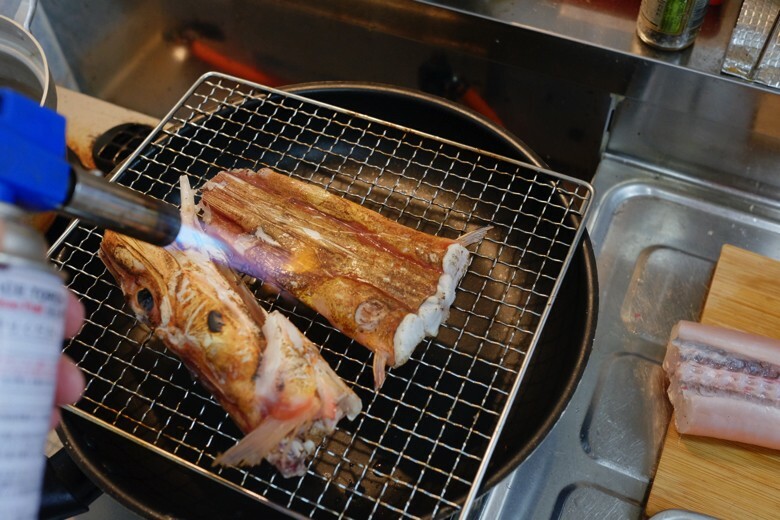 It’s originally supposed to be grilled by open flame of rice straws. 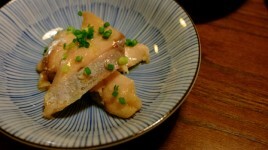 It would wear the characteristic aroma and taste beautiful. But I live in an apartment and the gas is good enough for me. 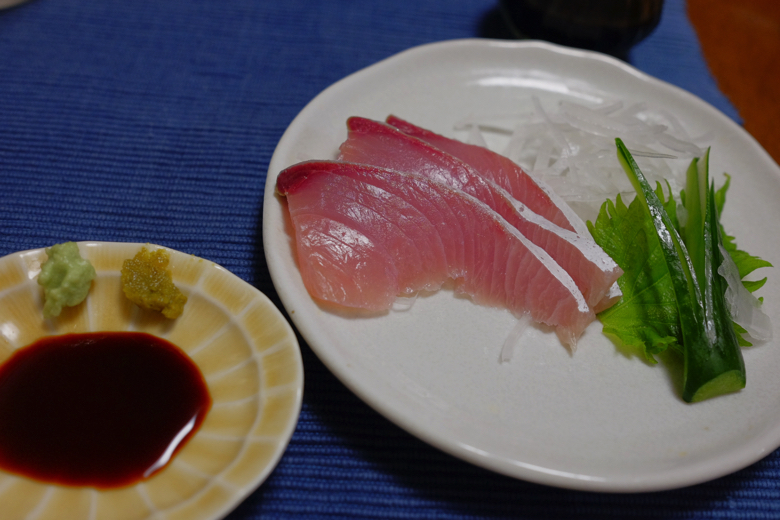 The Katsuo flavor is very strong. Nice to have it with ginger, garlic, citrus and all other herbs. 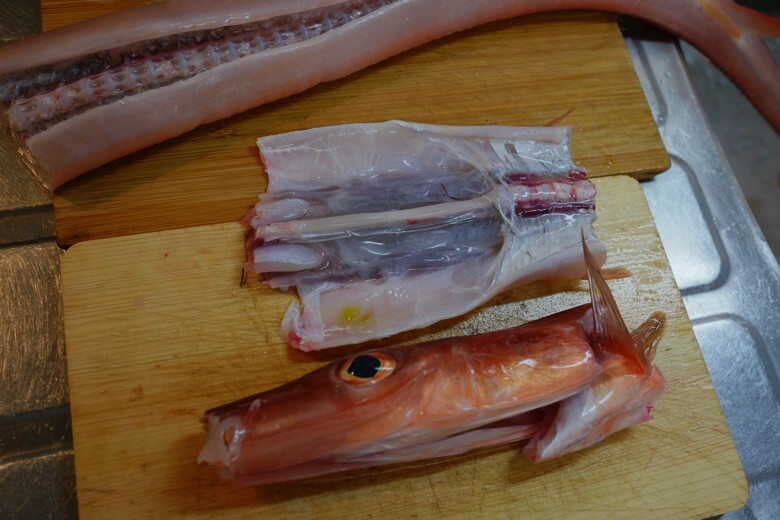 This fish is hardly found in the market also, but it is sold in very high price to fancy Japanese restaurants. Especially in Kyoto. 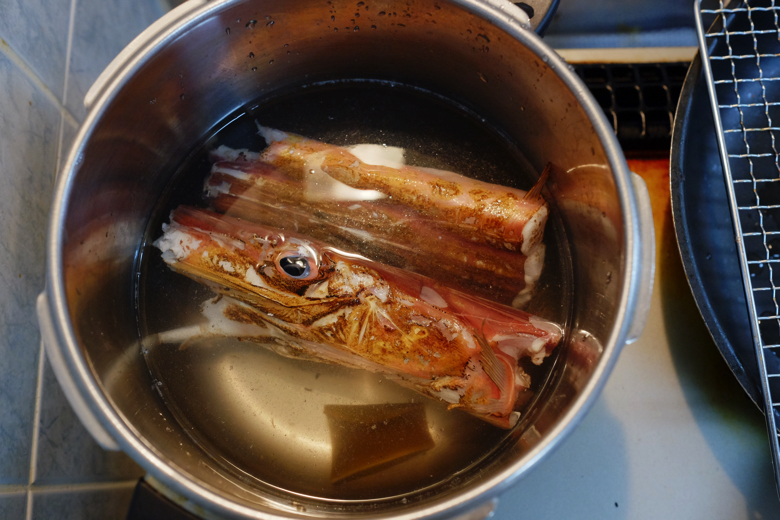 I’ve never cooked this fish, but I’m making the soup. This fish is definitely weird. The head occupies more than 1/3 of the body. The belly part hardly has meat. No ribs, but hard shield plates on both sides. So the half of its body is not edible. The available percentage is so low! Making this fish even more expensive. 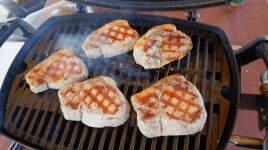 Grill the boney parts. 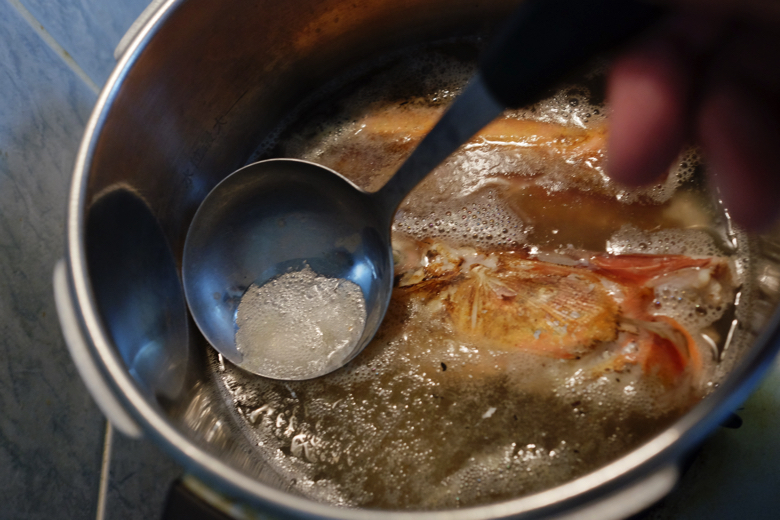 This will burn off the fishiness and brings out good flavor. Slowly bring it to boil with Konbu. Scoop up the foamy substance without disturbing the surface. This is the source of edgy harshness. Fishiness, in this case. “Aku” we call it. 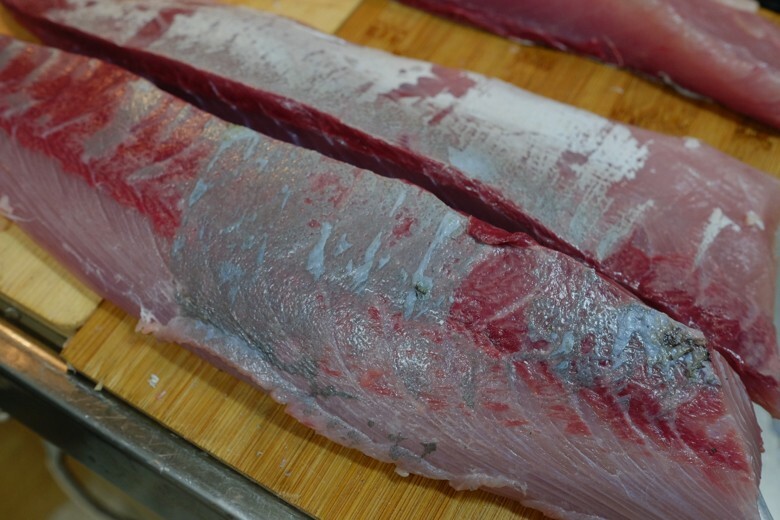 The first foamy organic matters which any fish, meat or vegetables release are harshness. But what they release after is Umami. So take out Aku just for a couple times and leave it alone after that. 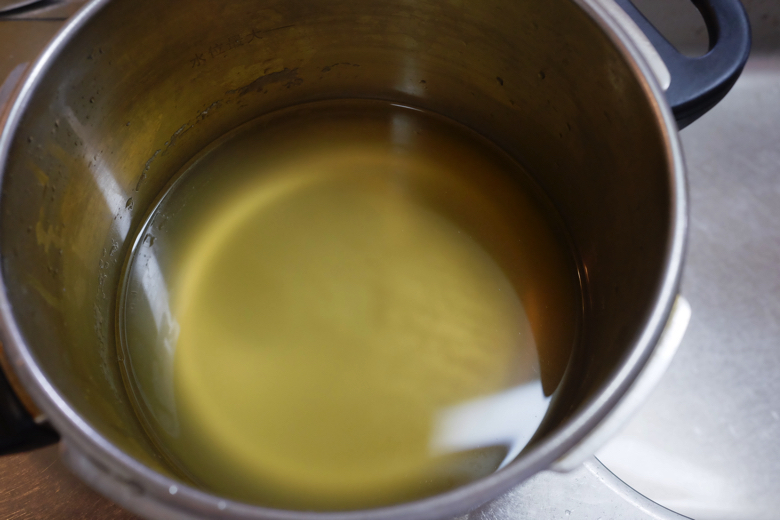 After straining, I got golden soup. 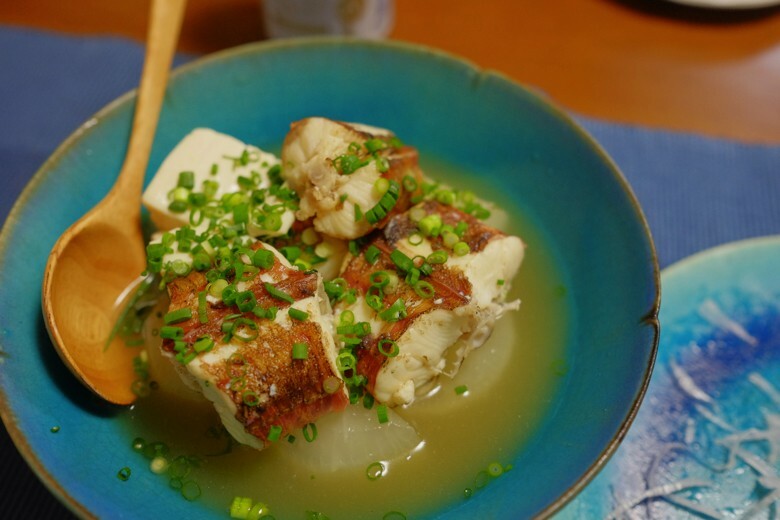 After I seasoned it with Sake, mirin, soy sauce, I boiled the fish meat with Tofu and radish. The meat was silky soft, very delicate flavor. 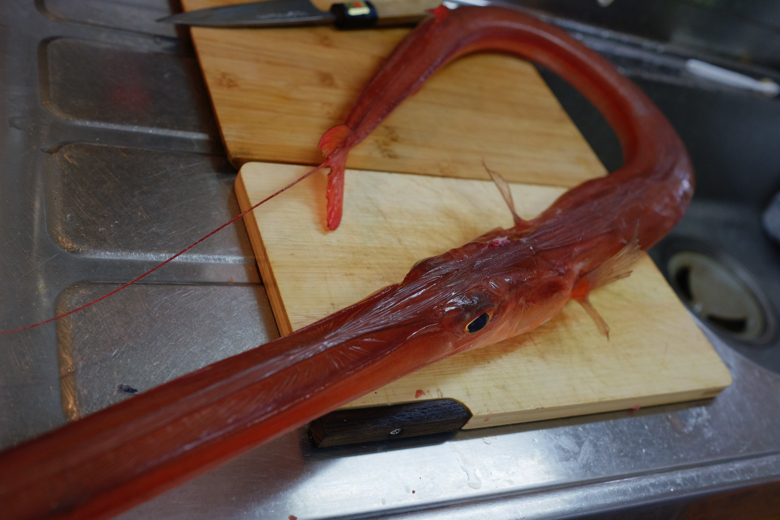 Now I know why Kyoto chefs love this fish. Here’s the star of this party. 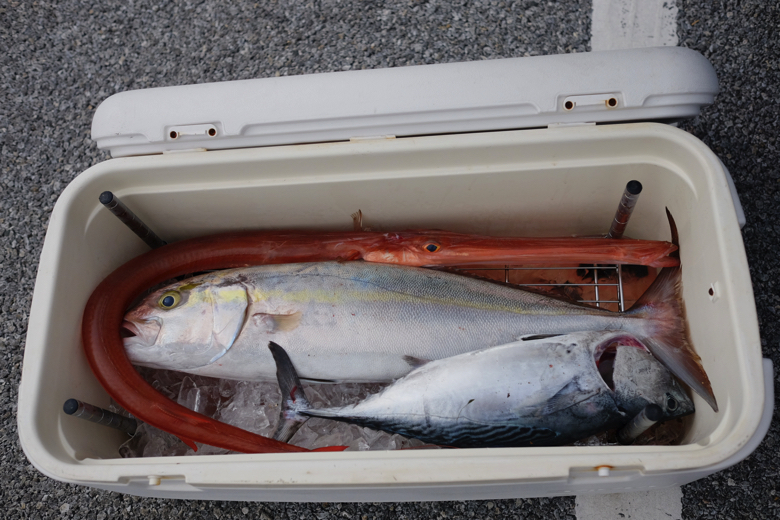 I got a 8kg amberjack. Oh wow. Look at that marble. Beautiful. It’s got so much fats under the skin that I had to wipe my knife after every stroke. This gotta be good. I can tell. I cured a part of it. 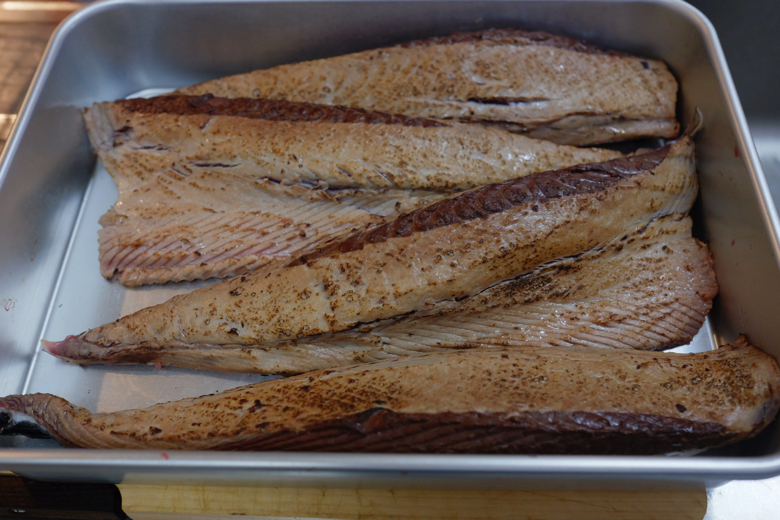 Salted and dried, it goes on top of the salad with spicy, sesami-oiled, Korean style sauce that YuYu made. 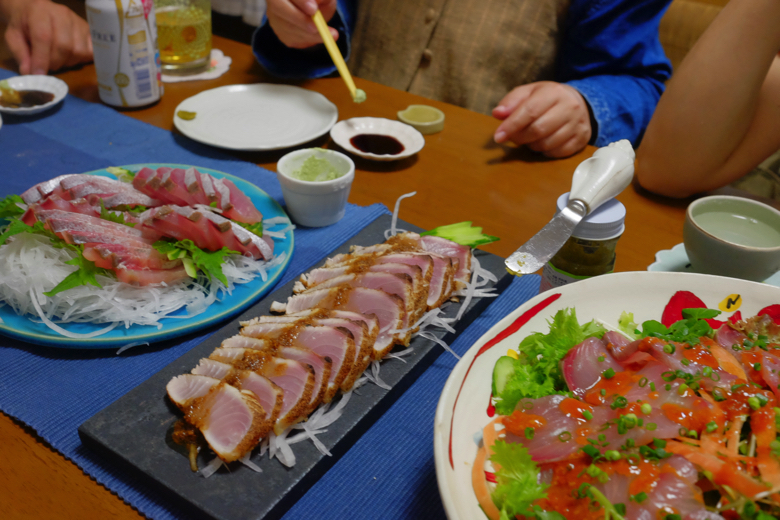 I made Tataki with a part of it also. With sauce of olive oil, balsamic vinegar, grounded ginger, miso and soy sauce. Oh my godness. 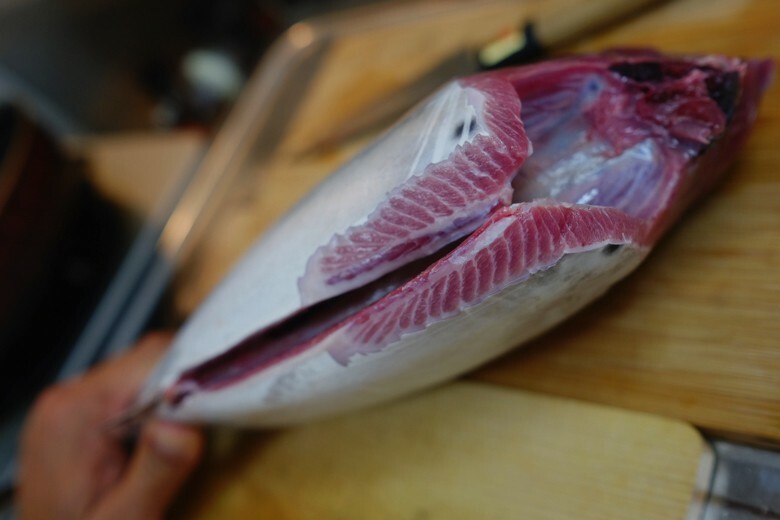 The best Kanpachi of the season. 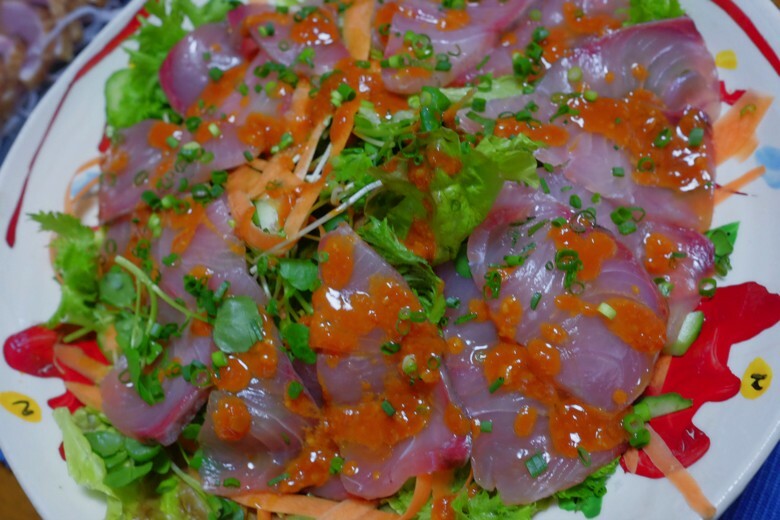 Crunchy, juicy, so flavorful. Packed with Umami and fats.